Spaghetti squash smothered in raw vegan alfredo sauce, made predominately from cashews, and intertwined with aromatic spices and herbs. To make it even better I added some broccoli and onions on top! 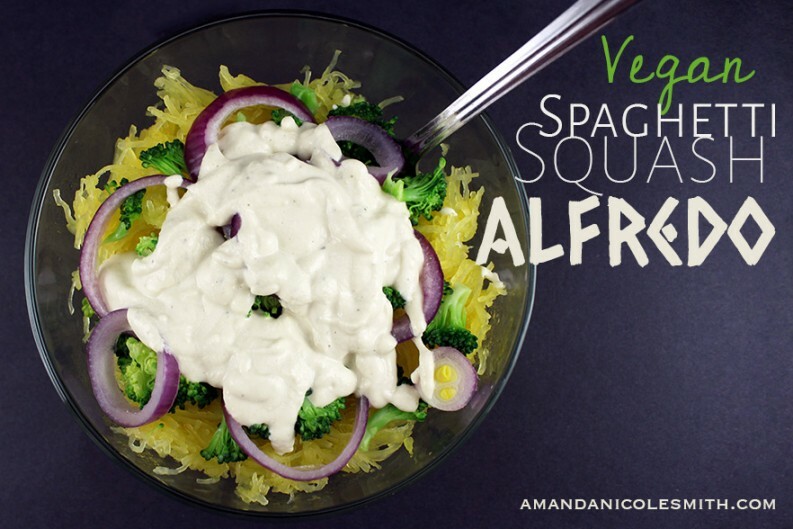 Many similar raw vegan alfredo sauce recipes exist but each one has their own creative spin. 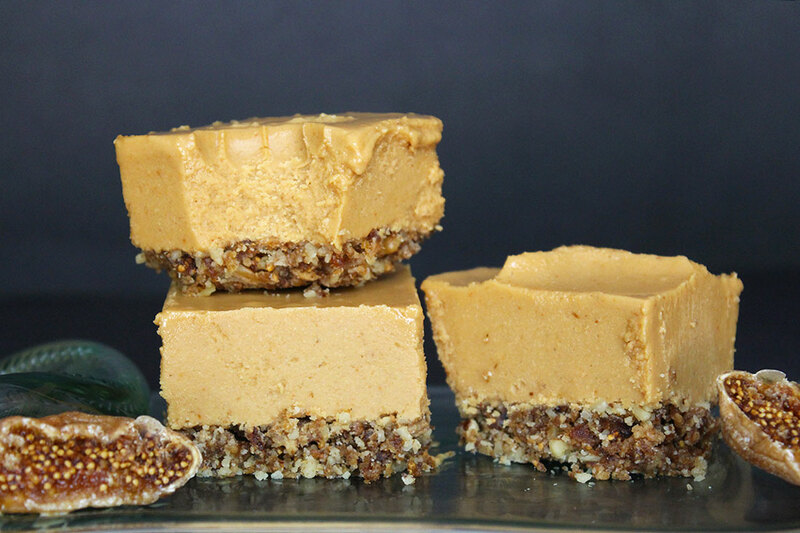 The sky is the limit when you are creating a raw vegan sauce. I always encourage everyone to experiment and make their own version using these measurements as a guideline. 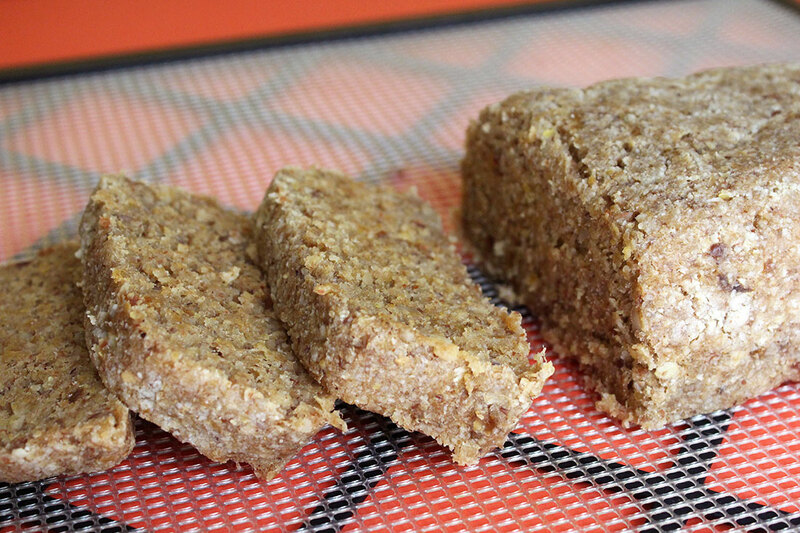 I have seen some recipes using macadamia nuts and pine nuts, which is a little bit more expensive but worth it. 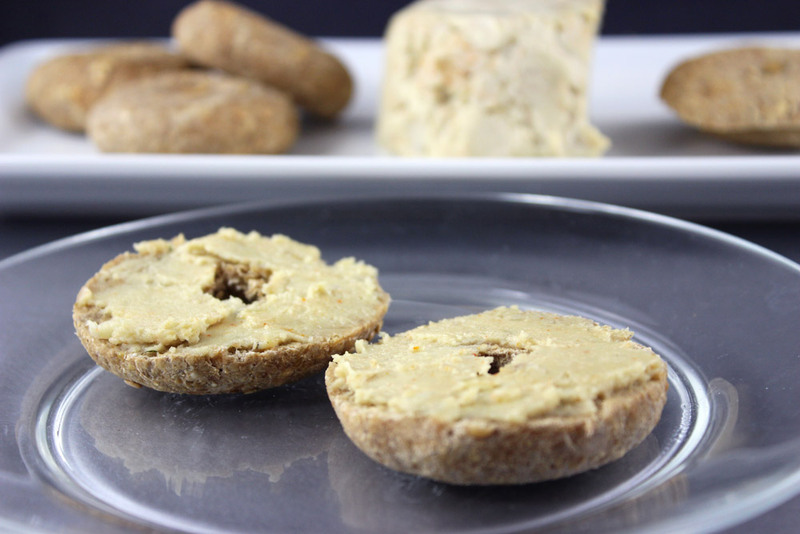 Cashews and almonds are the most popular base ingredient for raw vegan cheeses and dressings, but any creamy nut will do; even sunflower seeds can be used if you have a nut allergy. A lot of raw vegan alfredo recipes are strictly raw using spiralized zucchini noodles as a base. That’s great for summer but what about winter when zucchinis are not in season and are hard to find local and organic? There are so many spaghetti squashes at the farmer’s market, I have definitely been taking advantage of this amazing winter squash. 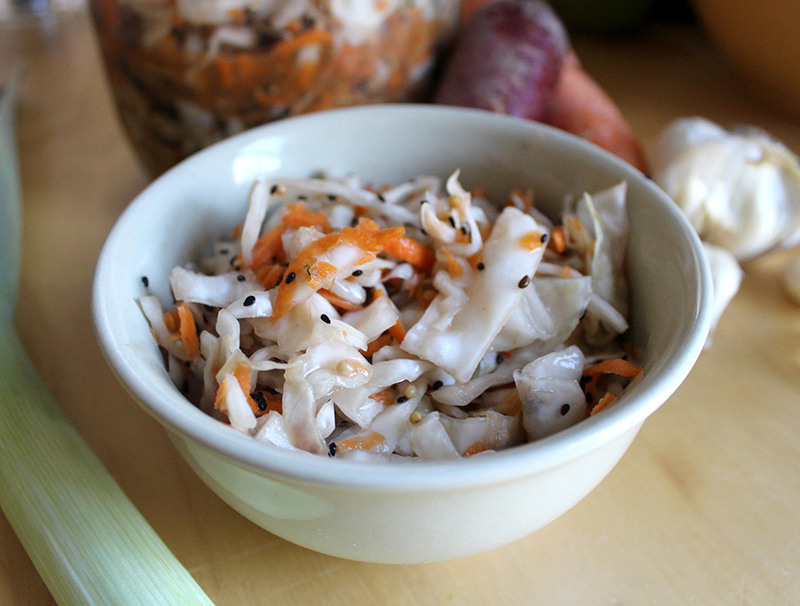 Plus you don’t even need a spiralizer, which most of us don’t have anyway. 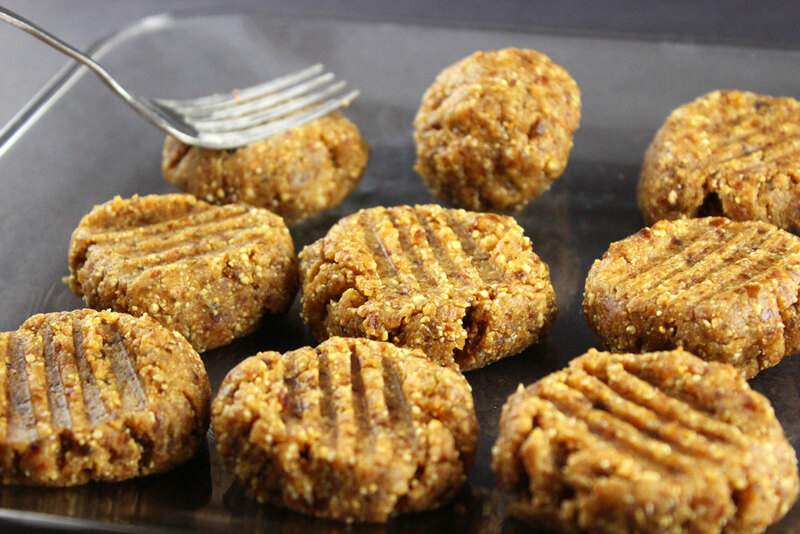 So this recipe is technically a fusion between raw and vegan because you get the best of both worlds of a non cooked sauce and a tender and warm cooked squash. Delightful! 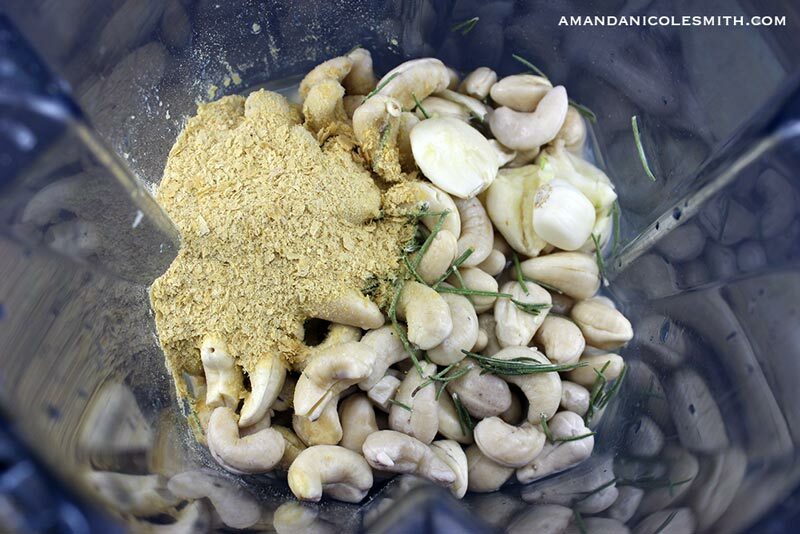 If you have a high speed blender, such as a vitamix, you can mix everything together without blending the cashews separately before-hand. 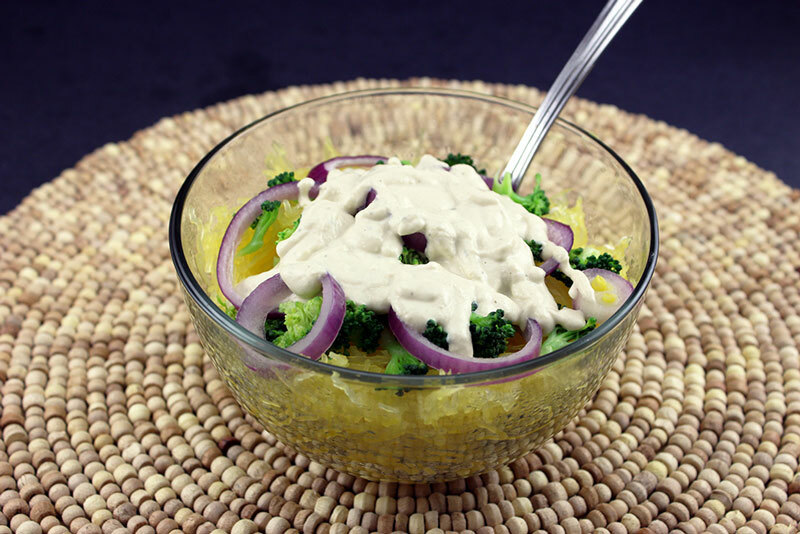 This raw vegan alfredo sauce recipe takes no time at all but the spaghetti squash must be cooked for 30-40 minutes or until tender. I also like to put this sauce on spinach to make creamed spinach or creamed kale, yum. Another creation I made the other night was stuffed brown rice pasta shells with mashed sweet potatoes and this raw vegan alfredo sauce, smothered with red sauce. 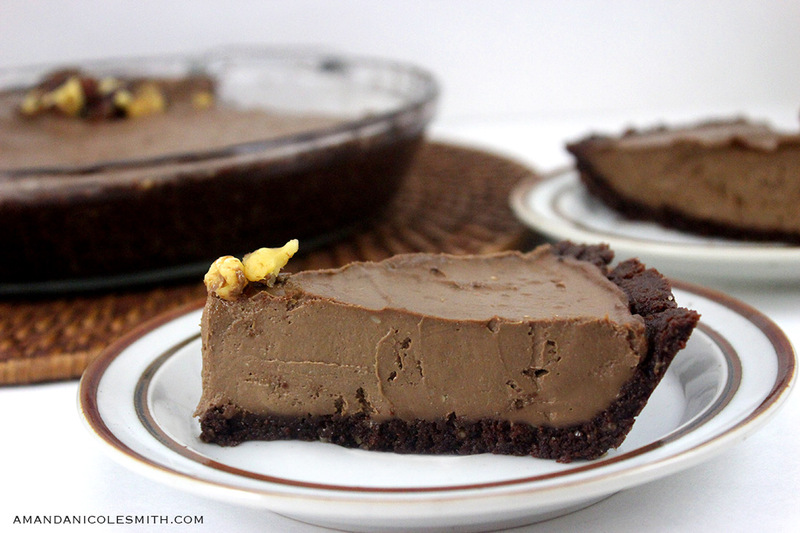 It was an on the whim recipe but it was amazing. 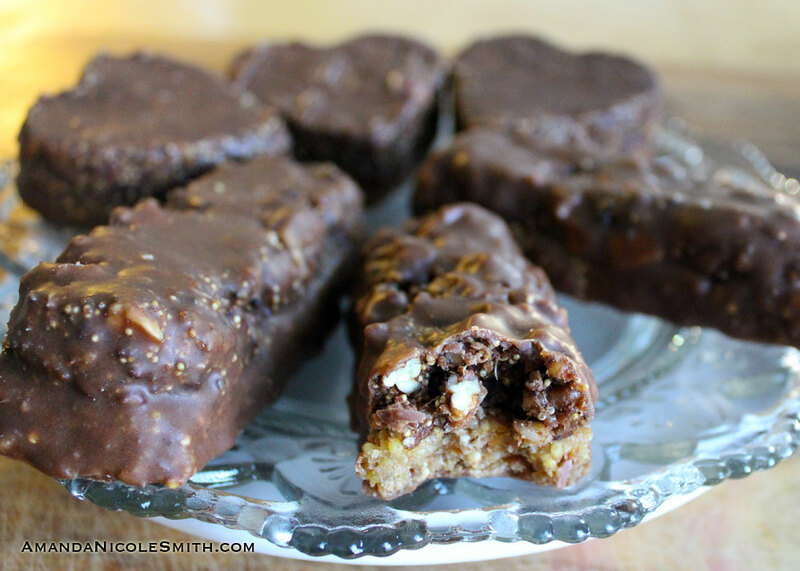 I will definitely have to post that recipe soon. I cut off the ends to make cutting the squash easier and then I use the ends to scrape the guts out. 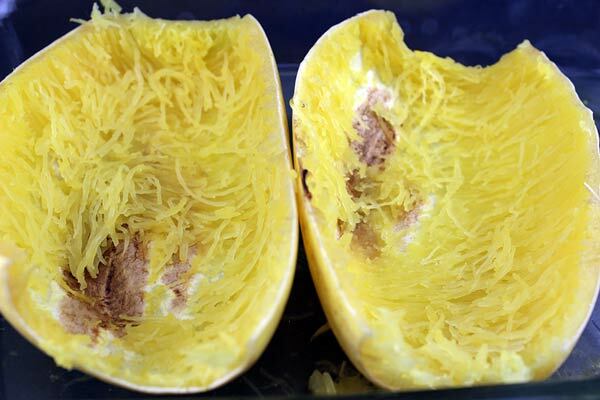 The consistency of a spaghetti squash can be bit crunchy if undercooked, if over cooked it can turn to mash; like a sweet potato. 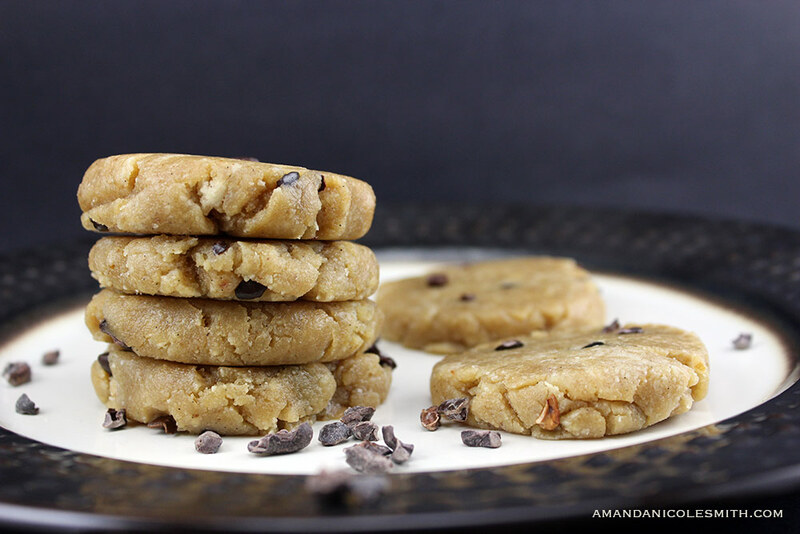 I would taste test between 30-40 minutes. Spaghetti squash smothered in raw vegan alfredo sauce, made predominately from cashews, and intertwined with aromatic spices and herbs. Cut 1 inch into the top of the squash where the stem is. Cut the squash vertically in half. 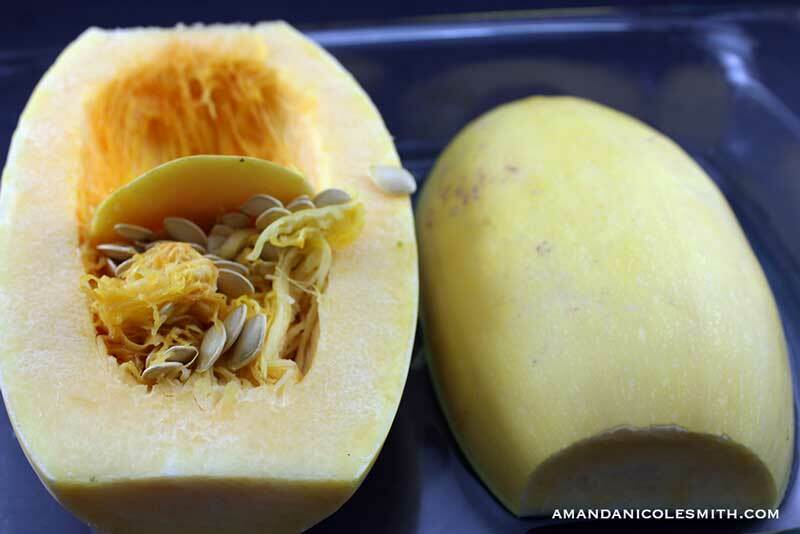 Scrape out the guts with the top of the squash. Put the squash face down in a glass baking dish with a 1/2 in of water. In the last 10 minutes of the spaghetti squash cooking add in the broccoli and onions. 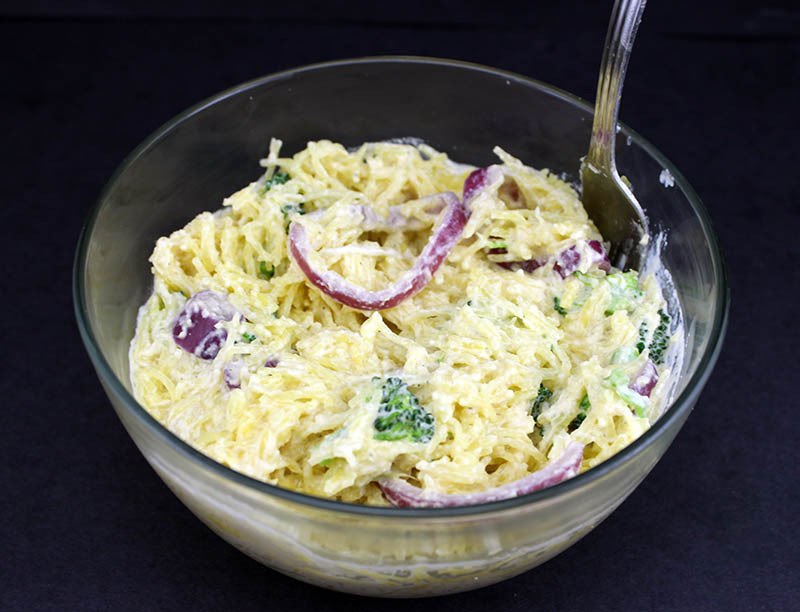 You could always add extra goodies to your vegan spaghetti squash recipe, like broccoli and onions. When the squash is 10 minutes away from being done add some broccoli and onions to the middle of the squash. I also must note that the cultured cashew cheese recipe can be used instead of whole cashews in the alfredo sauce recipe. This cheese takes time and patience but it is fermented and could be mistaken for cheese anyway. 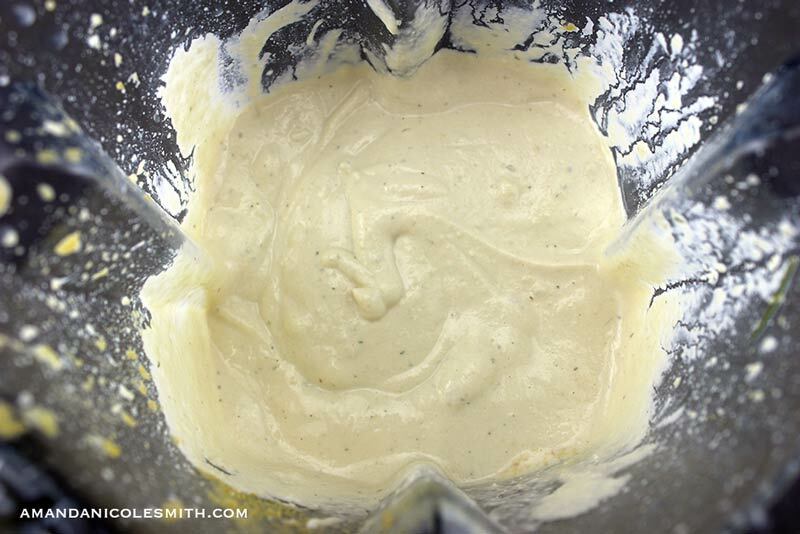 Make Your Alfredo Sauce with Cultured Cashew Cheese for the healthiest alfredo sauce ever!